Greenhouse gases absorb and re-emit some of the heat radiation given off by the Earth’s surface and warm the lower atmosphere. The most important greenhouse gas is water vapour, followed by carbon dioxide and methane, and without their warming presence in the atmosphere the Earth’s average surface temperature would be approximately -20°C. While many of these gases occur naturally in the atmosphere, humans are responsible for increasing their concentration through burning fossil fuels, deforestation and other land use changes. Although carbon dioxide is released naturally by volcanoes, ecosystems and some parts of the oceans, this release is more than compensated for through the carbon absorbed by plants and in other ocean regions, such as the North Atlantic. Had these natural carbon sinks not existed, CO2 would have built up twice as fast as it has done. Records of air bubbles in ancient ice show us that carbon dioxide and other greenhouse gases are now at their highest concentrations for more than 800,000 years. The IPCC presents six main lines of evidence for climate change. We have tracked the unprecedented recent rise in atmospheric carbon dioxide and other greenhouse gases since the beginning of the industrial revolution. We know from laboratory and atmospheric measurements that greenhouse gases do indeed absorb heat when they are present in the atmosphere. We have tracked significant increase in global temperatures of 0.85°C and sea level rise of 20cm over the past century. We have analysed the effects of natural events such as sunspots and volcanic eruptions on the climate, and though these are essential to understand the pattern of temperature changes over the past 150 years, they cannot explain the overall warming trend. We have observed significant changes in the Earth’s climate system including reduced snowfall in the Northern Hemisphere, retreat of sea ice in the Arctic, retreating glaciers on all continents, and shrinking of the area covered by permafrost and the increasing depth of its active layer. All of which are consistent with a warming global climate. We continually track global weather and have seen significant shifts in weather patterns and an increase in extreme events. Patterns of precipitation (rainfall and snowfall) have changed, with parts of North and South America, Europe and northern and central Asia becoming wetter, while the Sahel region of central Africa, southern Africa, the Mediterranean and southern Asia have become drier. Intense rainfall has become more frequent, along with major flooding. We’re also seeing more heat waves. According to the US National Oceanic and Atmospheric Administration (NOAA) between 1880 and the beginning of 2014, the 13 warmest years on record have all occurred within the past 16 years. The continued burning of fossil fuels will inevitably lead to further climate warming. The complexity of the climate system is such that the extent of such warming is difficult to predict, particularly as the largest unknown is how much greenhouse gas we will emit over the next 85 years. 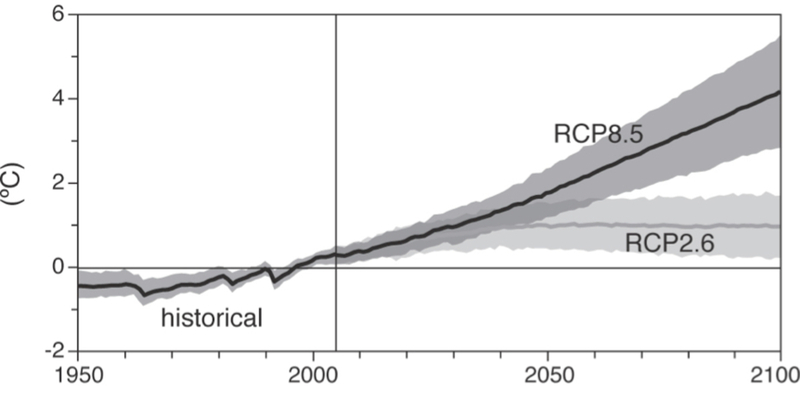 The IPCC has developed a range of emissions scenarios or Representative Concentration Pathways (RCPs) to examine the possible range of future climate change. 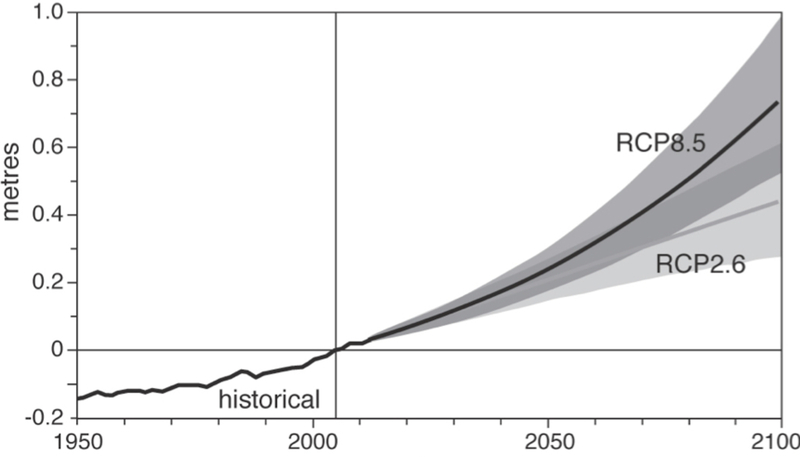 Using scenarios ranging from buisness-as-usual to strong longer-term decline in emissions, the climate model projections suggest the global mean surface temperature could rise by between 2.8°C and 5.4°C by the end of the 21st century. The sea level is projected to rise by between 52cm and 98cm by 2100, threatening coastal cities, low-lying deltas and small islands. Snow cover and sea ice are projected to continue to reduce, and some models suggest that the Arctic could be ice-free in late summer by the latter part of the 21st century. Heat waves, extreme rain and flash flood risks are projected to increase, threatening ecosystems and human settlements, health and security. These changes will not be spread uniformly around the world. Faster warming is expected near the poles, as the melting snow and sea ice exposes the darker underlying land and ocean surfaces which then absorb more of the sun’s radiation instead of reflecting it back to space in the way that brighter ice and snow do. Indeed, such “polar amplification” of global warming is already happening. Changes in precipitation are also expected to vary from place to place. In the high-latitude regions (central and northern regions of Europe, Asia and North America) the year-round average precipitation is projected to increase, while in most sub-tropical land regions it is projected to decrease by as much as 20%, increasing the risk of drought. In many other parts of the world, species and ecosystems may experience climatic conditions at the limits of their optimal or tolerable ranges or beyond. Human land use conversion for food, fuel, fibre and fodder, combined with targeted hunting and harvesting, has resulted in species extinctions some 100 to 1000 times higher than background rates. Climate change will only speed things up. The IPCC synthesis set in stark terms the global challenge of reducing greenhouse gas emissions. To keep global temperature rise below 2°C then global carbon emission must peak in the next ten years and from 2070 onward must be negative: we must start sucking out carbon dioxide from the atmosphere. Despite 30 years of climate change negotiations there has been no deviation in greenhouse gas emissions from the business-as-usual pathway so many feel keeping the climate change to less than 2°C will prove impossible. The failure of the international climate negotiation, most notably at Copenhagen in 2009, set back meaningful global cuts in emissions by at least a decade. Anticipation is building for the Paris conference in 2015 and there are some glimmers of hope. China, now the largest greenhouse gas polluter in the world, has discussed instigating a regional carbon-trading scheme which if successful would be rolled out across the whole country. Meanwhile the US, which has emitted a third of all the carbon pollution in the atmosphere, has placed the responsibility for regulating carbon dioxide emissions under the Environment Protection Agency, away from political wrangling in Washington. Support and money are also needed to help developing countries mitigate carbon emissions and adapt to inevitable climate change. Trillions of dollars will be invested in energy over the next 15 years to keep pace with increasing demand – what we must do is ensure that it is directed towards developing cheap, clean, secure energy production rather than exploiting fossil fuels. We must also prepare for the worst and adapt. If implemented now, much of the costs and damage that could be caused by changing climate can be mitigated. Climate change challenges the very way we organise our society. It needs to be seen within the context of the other great challenges of the 21st century: global poverty, population growth, environmental degradation, and global security. To meet these challenges we must change some of the basic rules of our society to allow us to adopt a much more global and long-term approach and in doing so develop a solution that can benefit everyone.